Get to Know: Breeders’ Cup Juvenile Fillies Turf Contender Conquest Harlanate: While looking through records over a certain filly named Conquest Harlanate, one can find that she is not exactly the best workhorse. She is commonly lost among the middle and underneath the best works. She is strictly, as of now, based at Woodbine, and shows she certainly loves the all-weather training surface. Breaking her maiden in her second start on the turf, Conquest Harlanate was thrown into stakes company today, Saturday, September 13, 2014. 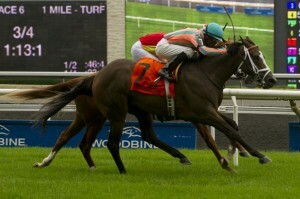 The Natalma Stakes (watch replay) was run on the turf at Woodbine at the distance of 8F (one mile). Conquest Harlanate did not destroy the field, but she will likely learn a lot from her hard fought victory against Isabella Sings, an impressive maiden winner last time out. Also, with the Natalma win, Conquest Harlanate is on her way to Santa Anita for the Breeders’ Cup Juvenile Fillies Turf. Conquest Harlanate wins the Natalma Stakes at Woodbine Racecourse on Saturday, September 13, 2014 earning an automatic entry into the Breeders’ Cup Juvenile Fillies Turf. Conquest Harlanate is just one of the Conquest Stables’ horses in which is talked about often. While she did improve in class quickly, Conquest Harlanate will likely have a lot to do to be considered the best juvenile filly on turf this year. It is also early in the season for the babies to start strutting their stuff. In her debut, Conquest Harlanate could only manage a third place finish at Woodbine on the polytrack. She did come back a bit less than a month later and took a maiden special weight by almost three lengths. She also seemed to appreciate the stretch from her first race at 5F to her maiden win at 6F. She seemed to appreciate the 8F stretch in the Natalma Stakes today. She took that race by a neck over the favorite, Isabella Sings. Her hard fought stretch battle with Isabella Sings likely will give Conquest Harlanate a lot of confidence for her next start. She learned that she can battle and win! Every horse needs to know that. The lesson is essential to a horse’s career. A horse that backs down from a battle in the stretch, or anywhere in a race for that matter, will likely always play bridesmaid, or worse. Conquest Harlanate may or may not have a final prep before the Breeders’ Cup, and if she doesn’t, I firmly believe her trainer Mark Casse will have her tight and ready to run come October 31. Conquest Harlanate has a very lovely pedigree, and it explains why she loved the stretch out to 8F today. She is by the great Harlan’s Holiday and out of the Dixieland Band mare, Allison’s Pride. Digging deeper into the pedigree, it is apparent, again, why Conquest Harlanate wanted more ground. Alydar, who failed to catch Affirmed in any of the Triple Crown races, sired her second dam on the distaff side. 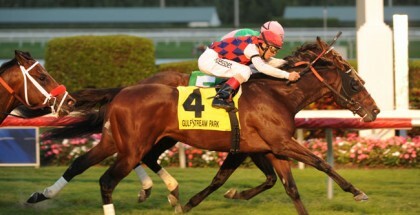 Ironically, Harlan’s Holiday is out of an Affirmed mare, named Christmas in Aiken. Looking further into the pedigree, we some inbreeding to horses such as Northern Dancer, Raise a Native, Native Dancer, and Princequillo. The Princequillo is also found both times as the damsire, which is what he is notorious for! The bloodlines of Conquest Harlanate say she could run all day, and likely on any surface. 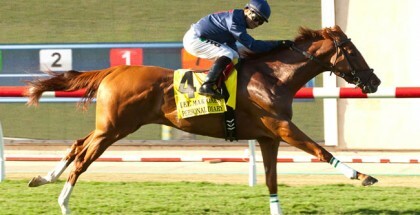 Look for Conquest Harlanate to move to the United States after the Woodbine meet. Mark Casse knows what he has with this filly, and will likely target the larger races, and maybe even the Kentucky Oaks, if she can transform her style to the dirt. 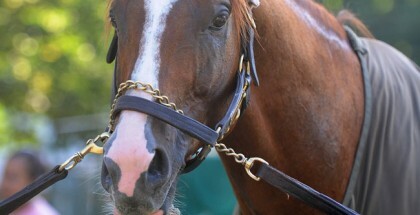 So far, there is no reason she couldn’t, so, be on the lookout for this filly. She is likely to make it big as she matures, and as long as she stays healthy, there is no reason she wouldn’t succeed on any surface at middle or longer distances.